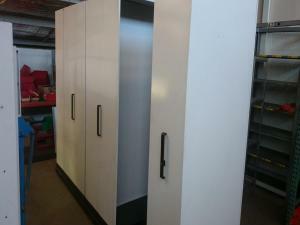 Mobile shelving is an economical and high-density mobile storage. The system allows for efficient storage with quick and easy access to stored goods. It is a versatile product that allows for any future modifications should requirements change. Because of its nut & bolt construct, components can be re-configured with ease. The free track systems used minimise components and create user-friendly accessibility that’s convenient for trolley or picking equipment. 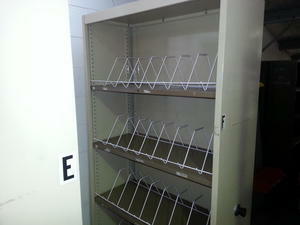 SECOND-HAND BASE MOUNTED MOBILE SHELVING UNIT! 2240mm High x 3200mm Long x 910mm Deep. Comprising; 1 x 425mm Single Static Bay, 1 x 425mm Single Mobile Bay & 2 x 850mm Double Mobile Bays.